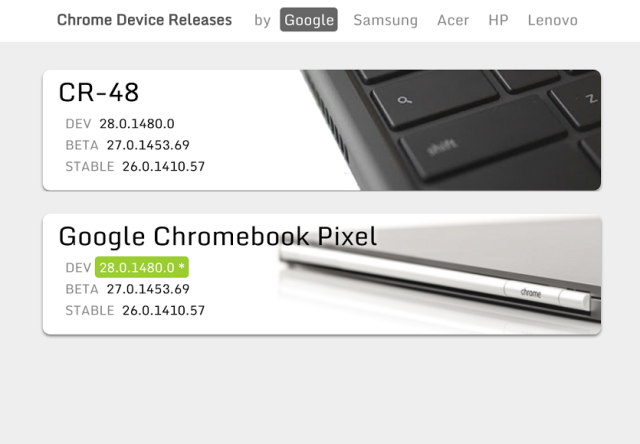 If you like to keep a close eye on the Chrome devices that are available then you may want to check out the Chrome Device Release page. François Beaufort has just updated it into a brand new format which allows for a quick view of current and past models of Chromebooks. The list can be grouped by manufacturer or reference device at the top of the page. 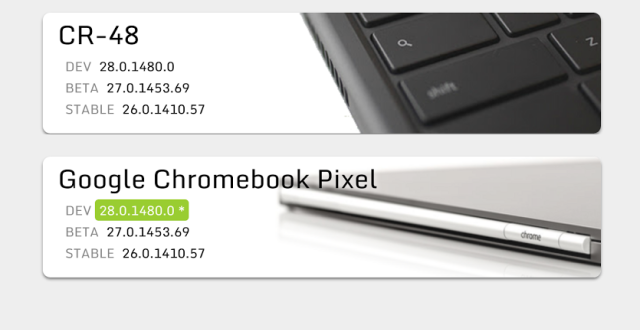 The page also lists the Stable, Beta and Developer version of Chrome is available for that device, most of which are exactly the same, except for the Samsung Chromebook which appears to be a version behind on the Developer version. This list also shows that unlike Android devices which suffer from a bit of Fragmentation, Chrome devices do not appear to suffer from this at all, even my original Chromebook the CR48 is up to date. It’s a quick reference that shows only a small amount of information, it would be great to see this updated with a spec sheet and more info for each model but we’ll take what we can get.